Outstanding at the recent Liebherr 2018 World Team Championships in Halmstad where she remained unbeaten throughout the whole tournament, on Saturday 9th June at the quarter-final stage of the Women’s Singles event at the Seamaster 2018 ITTF World Tour Lion Japan Open in Kitakyushu, Mima Ito flew the flag for the host nation. 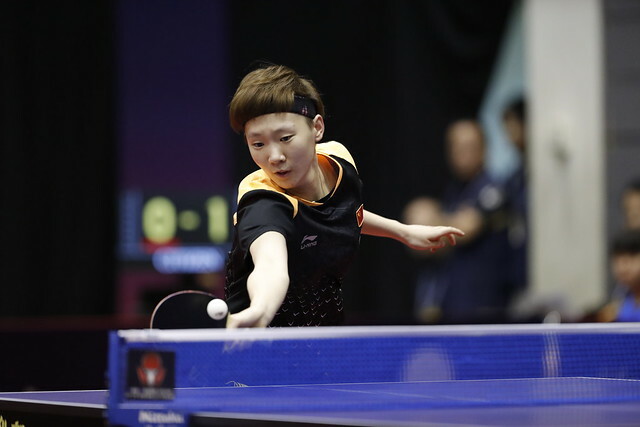 She booked her place in the semi-finals, following a round dominated by China which witnessed victories for Liu Shiwen, Wang Manyu and Chen Xingtong. The no.3 seed, she beat Chinese Taipei’s Cheng I-Ching, the no.5 seed, in six games (11-3, 11-7, 11-13, 8-11, 11-3, 11-6) and thus repeated the success enjoyed three years ago in 2015 when she had emerged successful at the Asian Championships in Pattaya. Success for Mima Ito but it was to be defeat for colleague, Kasumi Ishikawa, the top seed; after losing the opening two games against Chen Xingtong she mounted a brave recovery to level matters but was unable to maintain the momentum. Cheng Xingtong, the no.6 seed, emerged successful in six games (11-3, 11-4, 10-12, 9-11, 11-7, 11-9). A hard fought win for Chen Xingtong who, like Mima Ito, repeated an immediate previous success; last year the pair had met at the Seamaster 2017 ITTF World Tour Australia Open. On that occasion Chen Xingtong had also prevailed. Defeat for Kasumi Ishikawa, earlier in the day it had been the same outcome for colleague, Miu Hirano, the no.4 seed when facing Liu Shiwen, the no.8 seed; she was beaten four straight games (11-4, 11-7, 11-3, 11-4). The win meant that Liu Shiwen has now won all six encounters against Miu Hirano in international tournaments. Impressive from Liu Shiwen it was exactly the same from Wang Manyu, the no.2 seed, she accounted for her colleague and qualifier without the loss of a single game (11-5, 11-9, 11-8, 11-8). At the semi-final stage Chen Xingtong meets Mima Ito, Liu Shiwen opposes Wang Manyu. The penultimate round and the final will be played on Sunday 10th June.